Sechseläuten 2019 is taking place on April 8th. And It took 17 minutes 44 seconds for THE BÖÖGG’S HEAD to EXPLODe! Looking forward to a nice warm summer. Sechseläuten (“Sächsilüüte” on the local dialect) means “the 6 o’clock ringing of the bells”. It is an annual spring festival, that has been celebrating in Zurich since the 16th century. Back at that time, people worked untill 5 p.m. during winters because of not enough daylight, however, one day the City Council announced, that people could work untill 6 p.m. during the spring and summer months. This Spring Festival includes Guild’s Parade from Bahnhofstrasse to Sechseläutenplatz and burning of the snowman (Böögg) at the Sechseläutenplatz (the square in front of the Opera House). Another highlight of the holiday is Children’s Parade, which usually takes place the day before (on Sunday). As the young generation honourably wears historical costumes and celebrates spring with childish joy and happiness. Children’s Parade takes place on April 7th (Sunday) at 2:30 pm in the Zurich downtown. The Sechseläuten Guild’s Parade is taking place on April 8th (Monday), starts at 3 p.m. and runs from Bahnhofstrasse to Sechseläutenplatz (it’s a square in front of the Opera House). 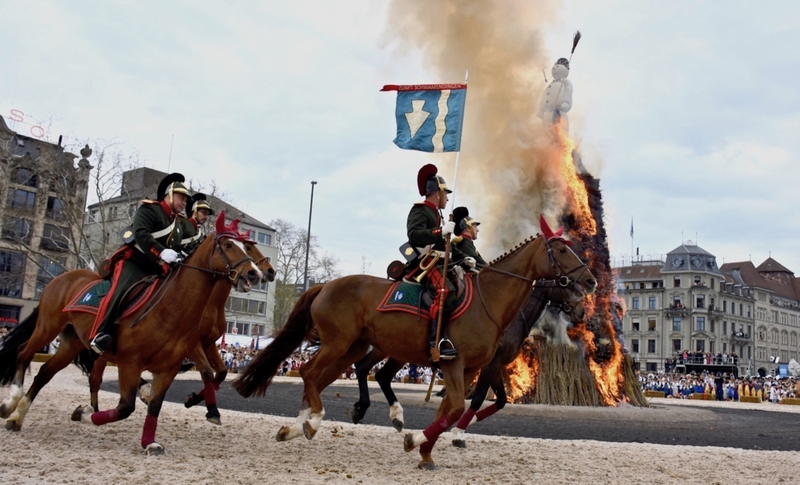 Burning of the Böögg starts at 6 p.m. at the Sechseläutenplatz. Tradition says that the faster the Böögg’s head explodes, the finer the summer will be. The festival is always very crowded, therefore, come early in order to get a nice view of the Parade and the Böögg. Trams run with the special schedule during the event, so don’t forget to check it out. You can purchase the tickets for the seating places a few days before the festival at the main train station, Bellueve and Paradeplatz. Prices 10 CHF and 25 CHF. The map with the parade route and seating places you may find in the photos below. The Parade demonstrates the traditions and costumes of the local guilds. More than 3500 guilds members, 350 riders, 50 horse-drawn carriages and 30 marching bands are participating in the procession. Be part of this parade is a great honour for the citizens. The parade route runs from Bahnhofstrasse to Sechseläutenplatz , where the pedestal for the bonfire with the Böögg is waiting. The Böögg is another important part of the festival. The Böögg – it’s a snowman, which symbolises winter. The tradition is to burn the snowman down and in this way send the winter away. The head of the Böögg is packed with firecrackers, so when the fire reaches his head it explodes with an impressive explosion. You may also want to check the video from the last year Sechseläuten. it is a nice tradition of gathering together, greeting the spring season and having fun while guessing of how fast the böögg’s head explodes. the believe is that the faster it explodes the finier summer will be. Great post. My guess 22 mins 18secs. Thank you. Let’s hope for a sunny and warm summer.